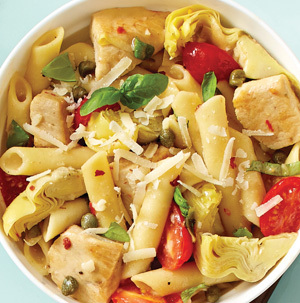 One-Pan Mediterranean Chicken Pasta | This RD Eats! Enough with the dishes! I’m not sure if it is life getting a bit crazier with the start of school, daycare, and work picking up, but I just want my supper mess to be less! Granted, I am extremely lucky that my amazing, wonderful, spectacular, handsome husband is the dish washer in our house (I know, right?!? How can a girl be so blessed? ), but some nights I just am ready to be done with the kitchen mess. So when I come across a one-pan recipe, I’m always willing to give it a try. *Note My hubby and I tag-team clean up. I gather all the dirty dishes, he washes, I dry and put away. So it’s not like I’m a total monster! And this time of year the basil and tomatoes from my garden are plentiful, so it is a great way to use them up. 1. Halve artichoke heart quarters; set aside. 2. In a large nonstick skillet, heat oil over medium-high heat. Season chicken with 1/2 teaspoon salt and 1/8 teaspoon black pepper; add to skillet. Cook and stir for 2 to 3 minutes or until golden brown, yet slightly undercooked. Stir in garlic; cook for 30 seconds more. 3. Add chicken broth, water, artichokes, pepper flakes, 1/2 teaspoon salt and 1/8 teaspoon black pepper to skillet. Bring mixture to boiling. Stir in pasta, making sure it’s fully immersed in the liquid. Cook mixture, covered, on medium heat until bubbly, then simmer for 2 minutes less than pasta package directions. 4. Remove lid. Stir in lemon juice, capers and tomatoes. Bring mixture to boiling; continue to boil for 2 to 3 minutes or until sauce is slightly reduced. Remove skillet from heat. Stir in Parmesan cheese and basil. Let stand for 2 to 3 minutes before serving. This entry was posted in Recipes and tagged chicken, Mediterranean, pasta, quick, Roasted Chicken, supper, tomatoes. Bookmark the permalink.